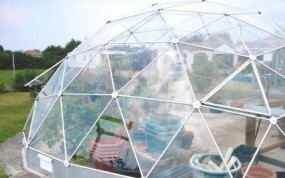 Solardome Industries Ltd was formed in 1995, however the original Solardome glasshouses date back to 1969. As the majority of these domes are still standing today, I get occasional calls for replacement parts, ranging from new hinges and door handles to full renovation. If I can identify the model of the dome, and the parts are still made, we can usually bring a new lease of life to an old dome, so it can be enjoyed for many more years. To help me in the identification of domes predating the current company I have an old set of handwritten ledgers going right back to 1969. If the original order was made before our computer systems were installed, I trawl back through the records to check that we have the correct dome. If I can’t find it the old-fashioned way, I resort to modern technology and ask for photos to be emailed to us. As all the models have different parts, it’s important to identify the correct one before we can take an order. Our latest success is the supply of replacement copings and capping disks to a customer in Prestatyn. He bought his SOLARDOME® 3 Deluxe in 1990 – order number 399, at a price of £1,618.05! The SD3 Deluxe (19ft6) is the equivalent of our current SOLARDOME® Retreat or SOLARDOME® Capella (20ft) models, although the profile of the older domes was much lower. Our customer took on the renovation himself working part-time over the summer. He worked on 10 panes of glass at a time, removing and cleaning before washing down the frame too. Our customer decided to have our new white copings and capping disks, rather than the original grey and we think they look rather lovely. I was so pleased to see the photos, as we’ve had several phone calls discussing the right parts to order and giving advice on getting the work done. I do begin to get to know our customers through these calls and it’s very satisfying to see a job well done and know that I helped in the restoration. Refurbishing the dome has given it a new lease of life and will hopefully keep it looking good for the next 23 years. The dome has always been used as a greenhouse and is apparently a bit of a landmark from the nearby railway, so if you’re travelling from Holyhead to Chester, keep your eyes open!